First, let’s wrap our eyes around the colour, I know, I know – what can I say – this should be on the menu at a Pretty in Pink reunion or a Pink Panther party or at Pink’s birthday or at the Pink Lounge on the Disney Dream! Ok, I’m over it – well, not really – but we have to move on! 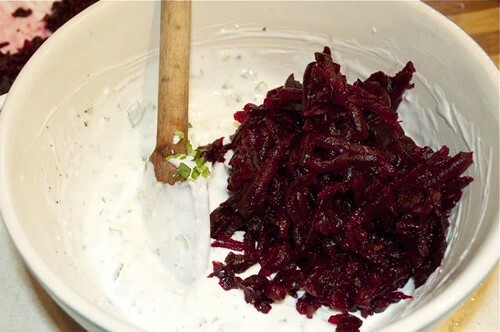 Roast a few beets (and I dare say, you can also make this with drained, canned beets), peel ’em, grate em, whip together a simple sour cream dressing using the flavours of borscht and voilà – another dip to bring to the party. And a word about borscht or borsch or bortsch or borstch or borsh or borshch – a classic Russian/Ukrainian/Polish/Latvian, let’s just say Eastern European soup, with as many variations as apparently there are spellings! Some have meat, some have cabbage, some have potatoes, some are hot, some are cold, some are chunky, some are smooth – I could go on, but I won’t, ’cause we could be here awhile. 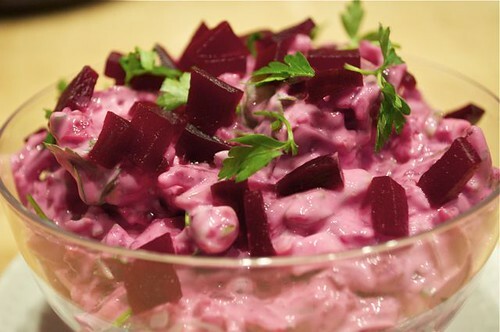 Most have sour cream and lemon juice, and all have beets – so on that note, I roasted a few beets, was about to make borscht and became inspired by it instead – meet the product of my inspiration! 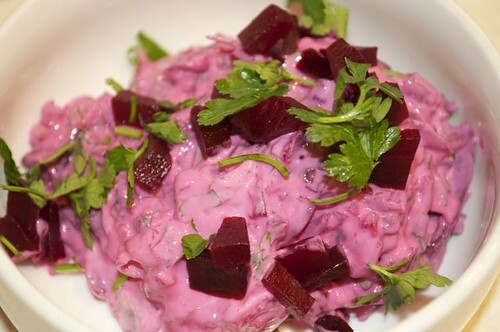 So in an attempt to keep it real, and not muddy the proverbial dip, I’ve stuck to the classic ingredients – beets, sour cream and lemon juice, along with a few supporting players like plain yogurt, scallions and chopped parsley. Oh don’t you worry, my dip-muddying days are alive and well and headed to a beet dip near you, like how about grated hard-boiled egg, cooked potato, apple, carrots, diced green peppers, chopped dill, horseradish, garlic – not to mention what’s hiding in your stash of herbs & spices: cumin, coriander, curry, smoked paprika, thyme, dill, oregano – I’ll go there next time. 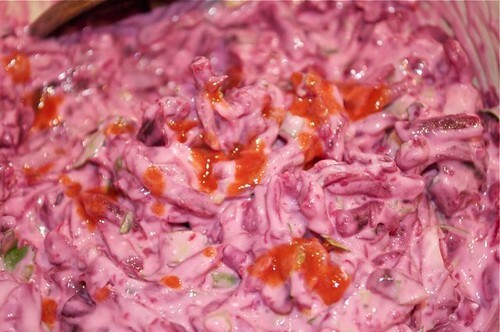 I kinda had to stifle myself – ’cause when you’re crazed, the less-is-more concept can be a concept we skirt, like issues – never mind, this is fantastic – tastes like borscht and lasts slightly longer ’cause it’s not in a bowl I can just pour down my throat! 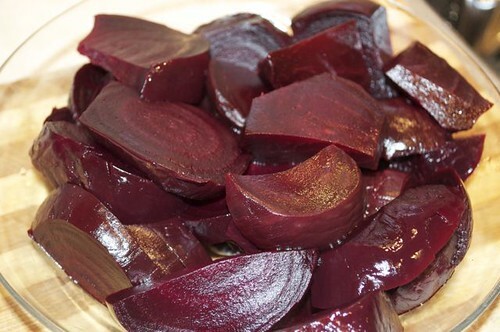 So be inspired, surround it with dippers and before I go, beets are as good for you as a good night’s sleep! Nighty, night! 1. Roast and peel a few beets. Leave them whole, they’re much easier to grate. As you can see, I was going to make soup which explains why my beets aren’t whole. Do as I say, not as I did! 3. 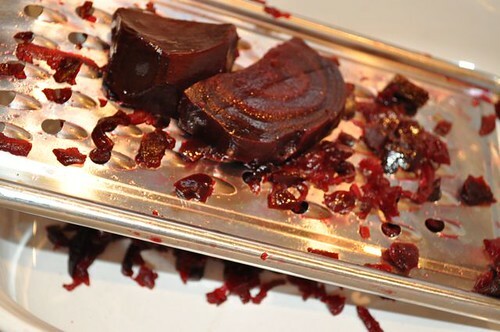 Keep grating until you have 2-3 cups of grated beets. 4. 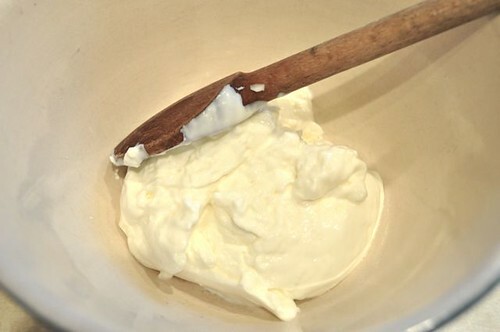 Start the dip – sour cream/plain yogurt combo. 5. 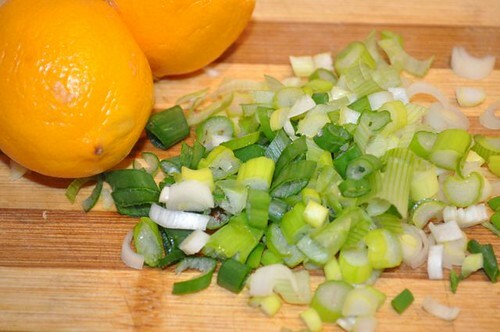 Juice a lemon and slice a couple of scallions. 6. 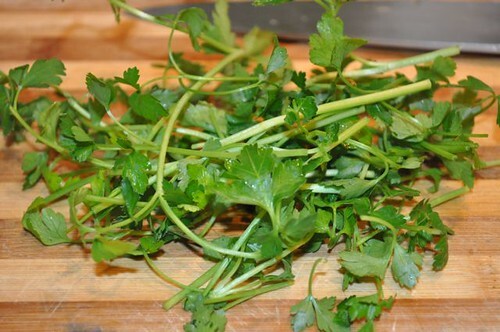 Grab a bunch of parsley. 7. Rinse a few sprigs. 9. 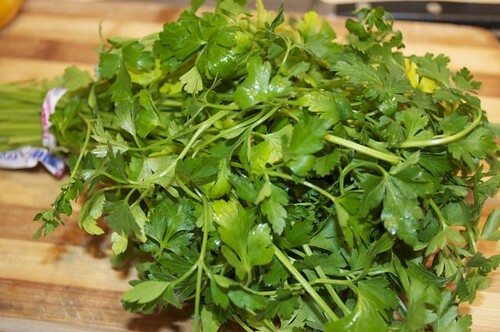 Stir it all into the sour cream and yogurt – scallions, parsley, lemon juice, s & p.
10. 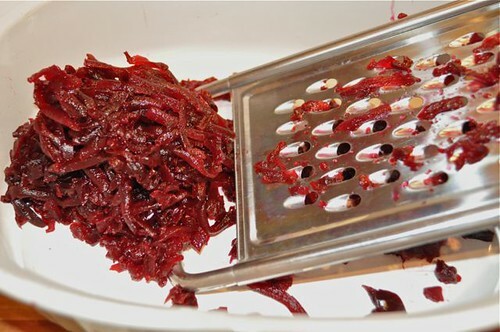 Now comes the fun part – the grated beets! 11. Stir them in gently. 12. Until it looks like this and hit it with a few shots of heat. 13. This is my tester bowl – finish with a few diced beets and chopped parsley – completely optional! The diced beets & parsley, not the tester bowl! 14. 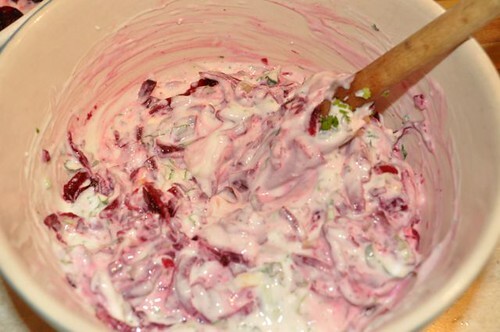 And this is my borscht-inspired beet dip ready for its’ close-up! 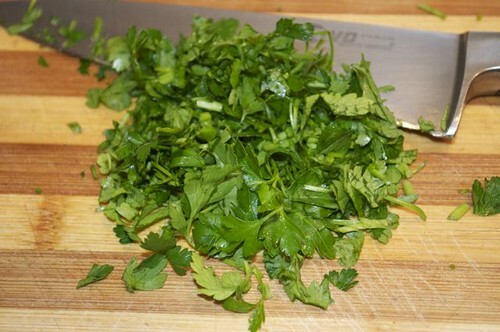 And if you prefer smooth – put the whole lot in the food processor and pulse a few times.